Clean Texas Car Moves To Mass. Looks great! 90k on a 240...you probably have one of the youngest bricks on the board. I bought mine from the original owner with only 40k miles. Now it has 60k. 1989 240. I added the Virgos, e-codes and IPD sway bars. A few thing on the interior too. I do like the virgos. I'm just waiting to drop mine off at the powdercoater. I THINK I am going to go with a powder chrome by prismatic. Today saw the newly re-freshed carpets installed. I just wish I could keep it this clean all the time. A trip to my local pick and pull yesterday turned up a very clean 1992 with heated mirrors. Not that this car will be on the road during the winter, but I couldn't help grabbing the mirrors and wiring even if just for the novelty of another "optional" switch on the dash. - New radiator. I somehow put a small hole in the original one while changing the water pump. I was much more careful with the new one. - And lastly an oil change. And good to know that the clock keeps perfect time. When I bought the car the previous owner spot fixed some areas on the front radiator support. The black stuff barely visible in the first picture was a very rubbery substance and just peeled off the panel. After getting all of this stuff off, there was no rust under the spots thankfully, I sanded and painted the panel. I had my local body shop mix up a spray can in the original factory color and I feel the match was perfect. It looks much cleaner now. I also added an extra grab handle, because I have extras, to the spot on the driver's side that doesn't have one. I took a bit of time early Saturday morning to give the trunk a good cleaning. In the process I found something worse than dog hair in carpet... short pine needles. Man these things get imbedded into the fibers. I had to use a pick to dig them out as I was vacuuming. I almost got to the point where I was thinking it would be easier to just buy or make a new carpet. The passenger's side trim panel, being made out of a fibrous paper-like material, has warped over the years and I have a new one coming, though it will be a bit as it has to come from Sweden. I flattened the right side wheel well cover, but it has warped again. I have seen reproduction ones made out of fiberglass and this will be on my "to order" list. The interior of the car is very clean with no evidence of corrosion, thank you Texas. What doesn't help the wheel well cover panel is the fact that the side paper cover panel only has a cheap, small clip to support that well cover. Poor design. I was actually thinking once I got the new one, and it not being out of shape, seeing if I could find a different material, say maybe a plastic, that I could duplicate the panel in and not have to worry about it being so fragile. Continuing with the cleaning I removed all of the body side trim, which was much easier than on my E30 BMW. The only thing that I had to research was the 8mm nut holding the rear most trim piece on. I initially removed these to make it easier to buff and wax the car, but what I found under them made me very happy that I removed them. I couldn't believe the amount of dirt that had accumulated under them. They do get very dirty under the trim. Knew a guy who always removed all the trim when he washed and waxed his 242 Turbo. His car was also "like new in the box" condition. As easy as this trim is to remove I can't see what you wouldn't remove it, at least once a year anyway. I would order a few extra of the rubber sealing washers and plastic pins just in case something is lost or a pin broken. Car just rolled past 90,000 miles today. Coincidently, while going to look at a 2015 Volvo XC60 for my Wife. Fitting. Parts finally arrived from Sweden and in the box was the trunk fiber trim piece. 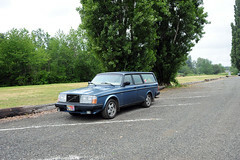 What possessed Volvo to make this out of a fiber material is beyond me. Though if I am only having to replace it 28ish years later I guess I can't complain too much. And the new piece wasn't that expensive. It goes well with the reproduction fiberglass wheel well "shelf". I also replaced the black factory floor mats with OEM blue ones that came in the blue wagon that I just picked up. With this car being the more "pristine" car I felt it deserved the correct color mats more. The wagon will be happy with the black ones. On a side note, I wish there was something you could treat this old plastic/rubber with that actually penetrated to bring back the original deeper color. I have seen the heat gun trick, transmission fluid trick and others, but what, if anything, works long term? Another nice addition to this car, as well as the other two that I own, is a complete set of factory manuals. I was on eBay just looking for the Volvo specific binders for the manuals I already have and I saw this complete set being offered. You will find that Volvo had very detailed manuals about their cars. Separate manual on how something works and diagnostic to how to tear it down and rebuild it. So much so that you would need many more binders to hold them all. And that is just for the 200 series. You got a good deal. Who did you order the parts from and how long did you wait? 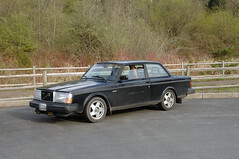 I ordered the parts from Tasca Volvo in Rhode Island. They worked with me when my local dealer wouldn't. They just told me the parts were no longer available. They took about 5 weeks to arrive. ^A lot of dealers don't know their heads from their rear ends. Back in 2008, I actually got in a verbal fight with a parts guy who said that all 240's with the B21/23 engines used bolts to hold the fan clutch to the water pump. Proved him wrong and got the parts I needed. Frequently, it's better to just give them the part number for the item you need. They'll order it.